When cooked right, Okra is delicious! 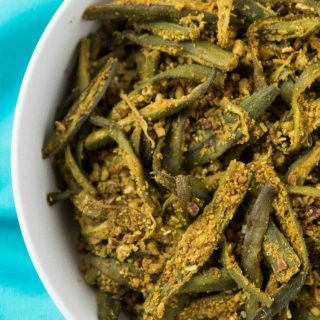 One taste of this Easy Curried Okra recipe, otherwise known as Bhindi Masala, will instantly make you an Okra lover! Wash the okra pods and pat dry using a towel or let them dry completely on a kitchen towel well ahead of time at room temperature. Note that it is very important to work with completely dry okra before cooking (to keep the okra from becoming slimy while cooking). Trim the ends of each okra. Using a dry knife, slice once lengthwise in half. In a large non-stick pan, heat 2-3 teasp cooking oil on medium heat. Add the black mustard seeds and fry for a few seconds. Immediately add the sliced okra. Saute on medium heat until completely cooked (~15-20 minutes), carefully flipping using a spatula and mixing a few times in between to evenly cook and keep from burning. Once the okra is tender and lightly browned, it is done cooking. Sprinkle on the Easy Indian Spice Blend and about 1/2 teasp salt to start. If using, add ground chili powder to taste for spice. Combine carefully and season to taste with additional salt. Slightly cover the pan, and cook for an additional 2 minutes. The dry spice blend should stick and mix into the cooked okra. If you feel like you need more spice, feel free to add a little extra of the Easy Indian Spice Blend . Garnish with some freshly chopped cilantro a little freshly squeezed lemon juice (if you prefer). Serve with some fresh home-made tortilla or rice! This dish makes the perfect finger food for toddlers.